This little elephant simply adores her favorite human - and she's not about to let anything bad happen to him. Kham Lha is one of the youngest residents at Elephant Nature Park, a sanctuary for pachyderms in Thailand. There, she's formed a remarkable bond with one staffer in particular, a man named Darrick. So strong is her affection for him, in fact, that she'll leap to the rescue at even the slightest hint that he's in danger. Here's an adorable video showing Kham Lha stepping in as Darrick's lifeguard (though he doesn't really need saving). This isn't the first time Kham Lha's appreciation for Darrick has been captured so clearly. Indeed, from previous videos, we've seen that he simply has to call her name and she'll drop everything to run and greet him. But there's a good reason why she cares for him so deeply. 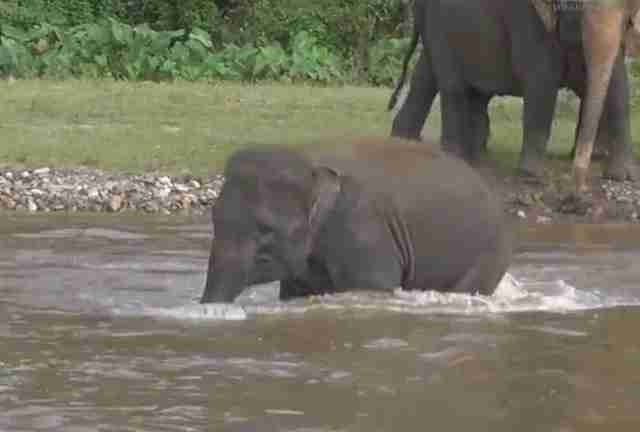 Kham Lha (sometimes spelled Kham La) was one of 19 elephants the sanctuary rescued from the tourism industry in 2015. At just 4 years old, prior to being brought to safety, she had been made to endure a cruel training 'crush' at the hands of her capture - so the warmth of Darrick's love at Elephant Nature Park must have come as a life-changing revelation. Sweet as it may be, there's a bigger lesson to be gleaned from the relationship between this elephant and her favorite person: When we show kindness to an animal, the rewards can last a lifetime. To help care for Kham Lha and other elephants like her, you can make a donation to the Save Elephant Foundation.